By the end of the Civil War the street level had been converted for business purposes. When James Wallace purchased the property at No. 73 Eighth Avenue from the Genet family in 1833, what had recently been farmland was quickly being developed. Greenwich Village had experienced a construction explosion beginning in 1822 when the devastating yellow fever epidemic in lower Manhattan resulted in hundreds of new Village residents. The growing population meant new homes, and new homes required lumber. James Wallace owned a lumber yard on 13th Street, not far from his new plot. The neighborhood would soon fill with lumber businesses like Wallace’s. He completed his handsome Greek Revival home in 1834. Its red brick, laid in Flemish bond, was trimmed in brownstone. The new architectural style did away with the peaked roof and dormers of the Federal period. Instead, attic windows punched through the wide fascia board. Wallace apparently branched into selling coal as well. He had retired by 1852, but in 1859 at least one city directory listed him as a “late coal” merchant. The Wallace family remained in the house until around the time of the Civil War; but by 1876 it was owned by Margaret Le Comte. Margaret Le Comte leased the rooms above over the Carpenter grocery store for both residential and business purposes. Benjamin Princellis operated his “segar” making shop here; and editor Juan Ignacio de Armas, whose offices were at No. 21 Park Row lived in the spacious second floor. Living in the attic floor was Caspar Castillo. He was a “cigar-stripper” employed by Princellis and made extra money as a watchman for the property at night. By 1878 the grocery store space was shared by the tea store of P. J. McDonnell. De Armas had moved on and McDonnell and his cousin, P. E. Nagel, the Secretary of the New-York Press Club, lived on the second floor. McDonnell had a bedroom just off the parlor and his cousin slept in a bedroom facing Eighth Avenue. Nagle was deeply sleeping, partly overtaken by the growing heat and smoke. McDonnell dragged him from the bed and managed to rouse him. When he turned up the gas jet, he saw that the heat of the fire was peeling the paint off the door. Nagle had shouted “Fire!” to a passing policeman. He threw the door keys to Officer Todd; but in his excitement the officer got the wrong key wedged into the keyhole. The street door was now impassable. Finally, the worsening smoke forced them out. They dropped onto the awning and clung to it until it began to collapse. Carefully they edged away from the meat hooks and dropped to the sidewalk. Fire engines arrived just after 3:20 and the front door was broken down. Nagle suddenly remembered he had left his treasured gold watch under his pillow. He ran up the fire ladder, but was too afraid to re-enter the burning rooms. A fireman came down with a bundled sheet, in which was Nagle’s watch. The flames were, by now, spreading up the staircase. Chief of Battalion Glaquel asked if anyone else was in the house. In the excitement and panic, the cousins forgot about “the Cuban on the top floor.” When firefighters broke open the skylight to release smoke, they looked in to see Castillo kneeling on the floor by the bed with his face buried in his hands. “It appeared that he had rolled out of bed, but had fallen insensible from the heat while endeavoring to reach the window,” advised The Times. Castillo was carried to the street where doctors tried to resuscitate him, with no success. The following morning the New York Clipper flatly reported that “a Cuban cigar-maker suffocated to death.” Fire investigators suspected arson, advising that the fire was most likely “the work of an incendiary.” The blaze had damaged the building and its contents to about $2,000—in the neighborhood of $50,000 today. The cornice of No. 71 still bears the name HAYES, a reminder of George Hayes's skylight business. He turned the decision into a marketing campaign; placing long-running advertisements in The Real Estate Record & Builders’ Guide that announced that a “complete and perfect Skylight” could be acquired only through him. 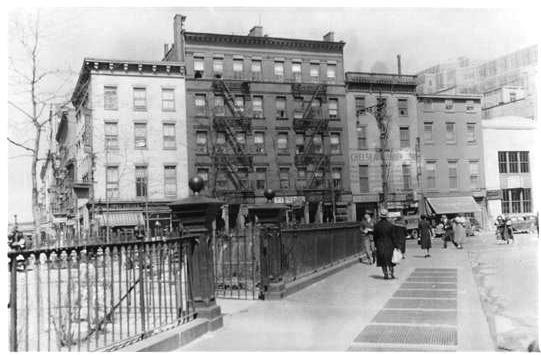 When he returned to New York he took the job at Haverly’s, and added to his income by working as a clerk in a butcher store on 15th Street, directly behind the theater. Despite his financial troubles, his warm personality made him a well-liked and popular character. But his finances worsened when Samuel Colville took over the 14th Street theater. Rigney lost his job soon afterward. Now out of work, he got another shock following the death of his wealthy sister. He learned that she had left her entire estate to a religious institution. "This preyed upon Mr. Rigney’s mind, and he was never the same man afterward,” explained the New York Clipper on February 8, 1890. The area around Amos Cross’s hotel and saloon was panicked by a small pox epidemic in 1893. Along with other businessmen and neighbors, Cross was concerned when, on November 21 that year, Joachim Hein was diagnosed with the disease. Hein lived and ran his cigar store directly across the avenue at No. 74. Two other families shared the three-story building. Amos Cross watched as the small-pox ambulance arrived across the street and took away 17-month old Gracie Weinhoff. Then, a few days later, it was there “with its funereal trappings of black, backed up against the curbstone in front of 74 again, and in a few moments two attendants appeared with another victim on his way to North Brother Island.” This was Frank Welch who lived in the Hein house. As with the other businesses along this stretch of Eighth Avenue, Cross’s saloon and hotel business suffered as patrons, fearful of the contagious disease, avoided the area. Amos Cross joined his fellow businessmen in demanding that Hein’s cigar store and the store in the neighboring house be closed “temporarily, at least” They told reporters that “mere perfunctory measures, such as fumigation, could not counteract the effects liable to result” if the public was allowed to come and go in those shops. Around the turn of the century Amos Byron Cross took on Herman Kreyer as partner in the hotel and saloon. It was possibly this fact that prompted Cross to transfer the title to No. 73 Eighth Avenue to Catherine M. Cross, his wife, as “a gift” in 1900. Cross’s Hotel was, perhaps, not always as upstanding as it seemed. On November 20, 1903 The Sun ran the headline “Nest of Con Men Turned Out” and reported on the raid of an illegal horse betting den—known as a poolroom--above Cross’s saloon. Seven men, deemed by the police as “about as fine a bunch of grafters and flim flammers as have been got together in some time,” were arrested. Herman Kreyer and Amos Cross were about to close the saloon early on the morning of May 28, 1905 when a young man came in and asked for a glass of beer. He placed a counterfeit quarter on the bar; but Kreyer was on to him and refused it. In fact, Kreyer recovered and was back running the hotel a year later when Princeton University instructor Joseph Greenwood checked in on May 28, 1906. Greenwood, who had graduated from the school a year earlier, routinely stayed the night when visiting his brother, Isaac J. Greenwood, Jr., whose pencil factory was nearby at 13th Street and Ninth Avenue. The two brothers went bowling that afternoon, then Joseph went to his third floor room in the Cross Hotel early in the evening. Two hours later he was found on the sidewalk with “severe contusions and possible internal injuries,” according to the New-York Tribune the following day. The newspaper admitted that Greenwood “jumped or fell” but had its own opinion. It ran the sub-headline “Supposed Princeton Instructor Tries Suicide from Window.” The theory was bolstered by Policeman Spiess, who charged him with attempted suicide (suicide was a crime at the time). On April 2, 1916 John Farley leased the “hotel and café.” Farley moved into the hotel which he operated into the 1920s. He was the brother of former Congressional Representative Michael F. Farley, who was the victim of a bizarre death on October 8, 1921. Michael Farley had purchased a new shaving brush and, after using it a few times, noticed a rash had broken out on his face. A week later his face was swollen and he could barely walk because of the pain. The natural-hair brush, it turned out, was laden with anthrax spores. When he cut himself shaving, he became infected. By the time he was taken to Bellevue Hospital on October 8 it was too late. John Farley was at his brother’s bedside when he died seven hours after being admitted. The ground floor space where Amos Cross’s saloon had been was the Half-Past Nine Greenwich Club in 1928. Prohibition was a problem for night clubs, one which the proprietors of the Half-Past Nine ignored. But on the night of December 29, 1928 the speakeasy was raided. The New York Times reported that the club faced “padlock actions” after being charged with Prohibition violations. When this photograph was taken on April 17, 1937 the Half-Past Nine Greenwich Club had been replaced with what appeared to be a grocery store (under the awning at right). To the near left is the entrance to Jackson Square park. from the collection of the New York Public Library. In February 2016, little has changed. When the old Cross Hotel building was sold in 1941 it was described as a “four-story apartment house” and was assessed at $45,000—about $725,000 today. In 1996 the building was renovated with one spacious apartment on each floor above a restaurant. With only moderate remodeling of the storefront, the Cross Hotel is remarkably intact above the first floor where it retains much of its 1834 appearance. Its sedate countenance successfully masks the colorful history that has played out within its walls.